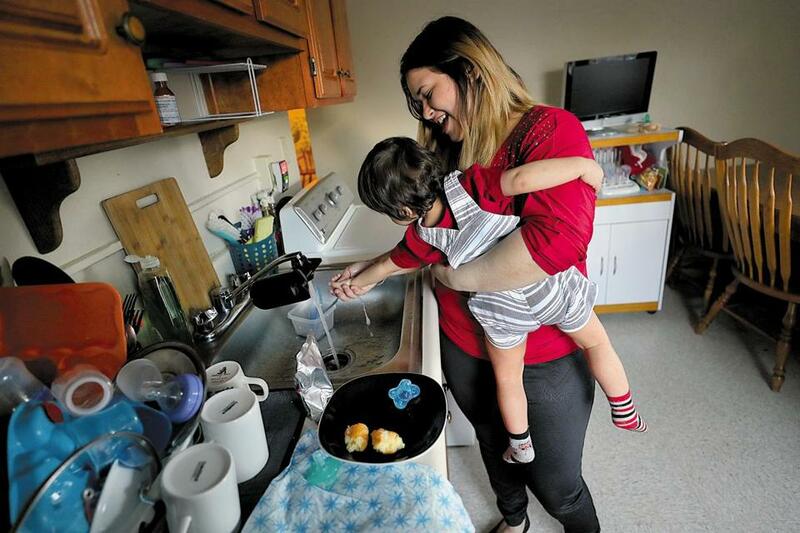 After Boston Medical Center helped Neslie Diaz and her son Angelov find housing, the 18-month-old started seeing improvements in his health and development. Boston Medical Center is embarking on a significant new initiative to tackle one of its patients’ most daunting problems: a lack of stable housing. One in four patients admitted to the hospital is homeless, and even more live in unsafe places or are at risk of being evicted — conditions that research shows can exacerbate health problems. Now, the hospital is tackling the problem by investing $6.5 million over five years in a variety of affordable housing projects throughout Boston. BMC is not building its own housing but partnering with other organizations, such as shelters and community development corporations, and paying them to renovate or build homes. The hospital has started asking patients about their housing needs. If they need a place to live, BMC staff refer them to workers at local housing organizations who can help secure placements. At the same time, the hospital is helping those organizations to open new units. The spending represents the largest investment in housing by a hospital in Massachusetts, BMC executives said. If the effort succeeds, they argue, more struggling families will find stable homes and, ideally, see their health improve. Fewer patients could wind up in the emergency room for preventable problems. “When you are treating someone with a medical condition, and they don’t know where they’re going to sleep that night, or they’re couch surfing, and they have limited funds, and they have to make a choice between purchasing a prescription or getting transportation to a doctor’s appointment . . . their health continues to get worse,” said Dr. Thea James, associate chief medical officer at BMC. The hospital’s 11 new investments in housing, announced Thursday, include: $1 million for the Pine Street Inn and the Boston Health Care for the Homeless Program to create a housing-stabilization program for individuals with complex medical problems; $800,000 to rehabilitate 35 units of housing in Fields Corner for people with mental illness and disabilities; and $200,000 to support upgrades at Boston Housing Authority buildings to better accommodate tenants’ needs. Housing, along with employment, transportation, food, and other necessities, is one of the “social determinants of health” — factors that can have a profound impact on physical and mental health. Hospitals have known about these factors for years but generally have not spent heavily to address them. BMC was required to spend millions on a community health initiative as a condition of state approval for a campus redesign project. Hospital officials used that requirement to launch a new strategy on housing. They expect their investments will support hundreds of new housing units. The housing investments are not just for patients: They are for anyone who needs and qualifies for affordable housing through the organizations BMC is funding. As the financial model in health care shifts to one that rewards providers for helping patients to stay healthy — instead of rewarding them just for treating the sick — many providers are taking a new interest in social factors. The state Medicaid program, is redesigning its care model next year with a greater emphasis on social issues. Even when families have a place to live, the costs can be so great that they risk being evicted or have little left to spend on other needs. Some live with hazards like pollution, violence, or rodent infestations. In children, the lack of safe and stable housing can stunt development, Sandel said. One of these patients is 18-month-old Angelov Diaz. When he was an infant, Angelov and his mother, 23-year-old Neslie Diaz, were living in a cramped home in South Boston with Neslie’s mother and sister. There wasn’t enough room for the baby to lie on his tummy or to crawl. He developed allergies, he was underweight, and he had trouble lifting his head. Through a pilot program at BMC, Diaz and her son were referred to the Boston Housing Authority, where they qualified for a subsidized apartment. They moved into their new home in Roslindale a few months ago. It’s a clean, quiet space, with room for Angelov to wander and spread out his toys, and to sleep in his own crib in his own bedroom. On their second day there, Angelov started walking. He’s getting bigger, and his development is catching up, his doctor says. With families like this in mind, hospitals in other parts of the country have been investing in housing the past several years. San Francisco-based Dignity Health committed tens of millions of dollars in low-interest loans to affordable-housing developers, helping to generate more than 14,000 units in California and other states. In one program that housed frequent users of Dignity’s emergency departments, the health system saw hospital visits and costs drop sharply. But huge challenges remain, acknowledged Pablo Bravo, Dignity’s vice president of community health. “The number who need help is overwhelming,” he said. Nationwide Children’s Hospital in Columbus, Ohio, has invested more than $8 million in housing programs over eight years. Hospital officials have found that admissions for asthma fell more quickly among children whose families received help with housing compared to children who received clinical care alone. In Massachusetts, other hospitals have started paying more attention to housing issues in recent years. Some are testing housing programs with grants from The Boston Foundation. Boston Children’s Hospital is in the early stages of planning a $5 million investment in housing initiatives, according to Children’s executives. The spending will help the hospital meet a requirement of state approval for its Longwood campus expansion. At BMC, executives plan to study the results of their housing projects to determine which ideas are the most promising. In one project, the hospital is providing a $1 million no-interest loan and a $400,000 subsidy to support a new food market in the Bartlett Station mixed-use development in Roxbury. The money will help the market to open sooner, which in turn should help attract more tenants to the neighborhood, said David Price, executive director of the Nuestra Comunidad Development Corporation, which is developing the Bartlett project. “It’s quite likely this would not be possible without BMC’s help,” Price said.